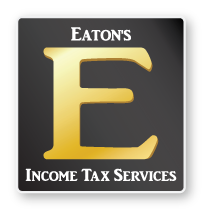 Eaton’s Income Tax Service’s team is here to prepare your income tax return, and to advise you on tax matters. Scott Eaton, Mark Dobrilovic, Rocky Makowski, and Katie Anderson are Enrolled Agents (EA), tax experts authorized by the IRS to prepare returns and represent taxpayers before the Internal Revenue Service for audit, and other tax matters. An Enrolled Agent has the same status for representation as attorneys or CPA’s. Because of the difficulty in becoming Enrolled Agents, there are fewer than 60,000 EA’s currently active. Many tax preparers are not EA’s, and therefore are limited in their training, not required to uphold ethical standards nor fulfill continuing education requirements. All of the more than 1,600 tax returns we file each year are prepared by our EA’s. We work with individuals, families, and small business owners to help them solve their tax problems. No one should pay more tax than the law requires of them. Ensuring that you are taking advantage of all the opportunities available to you to reduce your tax liability is our goal. Planning for the future is vital to tax savings. We offer advice for growing families, entrepreneurs, investors, rental property owners, and retirees looking for the good life. Business owners come to us for help with tax strategies to reduce their costs and improve their bottom line. We help sole proprietors, partners, LLC’s, and corporations find the right entity form to suit their business. As you prosper, we show you how to take advantage of changes and developments that will save you tax dollars. Responding to the IRS and other tax agencies is another important service we provide. Whether it is an examination of a previous year’s return, or an inquiry for missing information, we can help you decipher the sometimes puzzling notices you might receive. If you do find yourself under examination, commonly called an audit, we can help guide you through the process and resolve your difficult issues. We have been able to save clients many thousands of dollars by making sure that the IRS does not ignore legitimate deductions or incorrectly calculate taxable income.